Sicily lies just 5 km off the coast of Calabria (the "toe" of Italy), across the Straits of Messina. It is the largest region in Italy in terms of land area, with a population of about 5 million. Sicily was once a territory of great strategic significance, as borne out by its long and illustrious history of being a dominant Mediterranean power and trading centre. On it the ancient Greek Corinthians built the city of Syracuse, which prospered as the most powerful Greek city of the Mediterranean for a time. Palermo, originally an ancient Phoenician port, became capital of the Kingdom of Sicily from 1130 to 1816. This kingdom later united with the Kingdom of Naples to form the Bourbon-dominated Kingdom of the Two Sicilies (1738 - 1861). Sicily's 1,000 km of coastline is made up of rocky beaches to the north and sandy ones to the south. Most of the island's landscape is mountainous, with Mt. 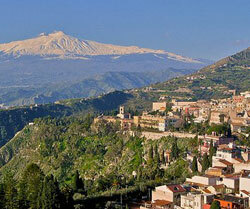 Etna, Europe's largest volcano, located on the eastern side, set in a national park. Wide plains cover the eastern province of Catania. The climate is hot and dry, excessively so in the summer. Sicilians speak their own language, which is quite distinct from Italian (although most residents are proficient in Italian). They are proud of their heritage and identity, and may take offense if you consider them as just like Italians of the mainland. Sicily may be a part of Italy, but it governs itself as an autonomous region, with its own President and Regional Assembly. Architecture in Sicily is marked by an eclectic mix of influences, infused with Greek Corinthian, Arabic and Norman styles, among others. It also developed the Sicilian Baroque form of architecture, which is an especially flamboyant and ornamental style of Baroque with prominent use of chiaroscuro sculptural effects. Sicily would seem to have it all - Mediterranean climate, a splendid natural setting, a distinct and fascinating culture, delightful cuisine, and good wines. It is becoming more and more popular as a place to buy a vacation home. Palermo is a stunning sight, sweeping along the curve of a large bay facing the Tyrrhenian Sea, beneath the looming cliffs of Monte Pellegrino. The bay forms a natural harbour, which accounts for the city's name: "Palermo" comes from the Greek word Panormos, which means "all port." It is an ancient city, whose origins may date to pre-history; Palermo has been occupied by many of the great Mediterranean powers, including the Phoenicians, Carthaginians, Romans, and Byzantines. The Arabs and the Normans have also held sway over Palermo, and account for much of its distinctive medieval architecture. Palazzo dei Normanni, or Palace of the Normans, is one of the best examples of the Arab-Norman-Byzantine style that developed here in the 12th century. Palermo's most fascinating neighbourhood is the Quattro Canti quarter, the historic crossroads of the city. It is surrounded with Baroque monuments and buildings, such as the 17th-century Gesu Church, an icon of the distinctive Sicilian Baroque style. Yet another architectural style developed in Palermo with the work of Ernesto Basile, a prime exponent of the Italian Art Nouveau style known as "Stile Liberty." One of his best-known buildings, the palatial Villa Igiea, stands on a clifftop just outside Palermo, overlooking a luxurious marina. The villa is actually a Hilton hotel, but this commercial aspect is toned down and the building can be enjoyed on a purely aesthetic level. Like the rest of Sicily, beautiful olive groves and citrus orchards dot Palermo.